Hitler on propaganda – despite the claims, he was no fool! As a truth-seeker, I’m always very interested in lies, particularly WHY people lie. For it is when we understand WHY people are lying and misrepresenting things that is the best clue on where truth can be found, often more than WHAT they are lying about. Hitler in his Mein Kampf shared his revealing thoughts on propaganda – lying as a strategic tool to achieve a given purpose. It has dangerous similarities with the Purpose-Driven movement that has arisen more recently within Christendom. When people in power lie to me here in Samoa, I’m intrigued. I ask questions and keep on asking questions until I understand what is going on. When I get to the bottom of it, I may take the matter further; I may park it and wait; I may take action, but I always dig until I understand. 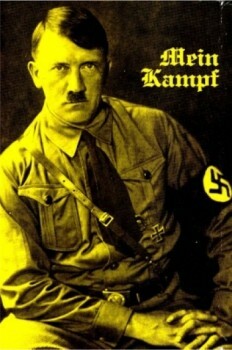 Hitler is widely held to be the pin-up poster boy for propaganda, certainly in the Western mainstream media at least. Digging into his Chapter on Propaganda in Mein Kampf, a lot of his thought processes are pretty clear. They can be basically summed up in the phrase, ‘The end justifies the means‘ and the corollary that ‘propaganda is a [legitimate] tool‘. He analysed Germany’s position in regards to the use of propaganda during the Great War (WW1) and came to the conclusion that England understood the importance of using propaganda and applied it well but German leadership failed to do this effectively, thus disadvantaging themselves. for [propaganda] is nothing but a weapon, and indeed a most terrifying weapon in the hands of those who know how to use it. Had we any propaganda at all? Alas, I can reply only in the negative. All that was undertaken in this direction was so utterly inadequate and misconceived from the very beginning that not only did it prove useless but at times harmful. In substance it was insufficient. Psychologically it was all wrong. Anybody who had carefully investigated the German propaganda must have formed that judgment of it. Our people did not seem to be clear even about the primary question itself: Whether propaganda is a means or an end? I note that many adherents to the ‘Business of God’ thinking slip into deception as well, listening to people within the church growth movement who equate growth in numbers with success, blessing and God’s will. Purpose driven ministry at a corporate and personal level is an anathema to the heart, practise and teaching of Christ who sought relationship, not religious activities or systems. Hitler’s thinking parallels this move within the church, where things that would not normally be accepted slip into acceptance through silky words of persuation. Propaganda is a means and must, therefore, be judged in relation to the end it is intended to serve. It must be organized in such a way as to be capable of attaining its objective. And, as it is quite clear that the importance of the objective may vary from the standpoint of general necessity, the essential internal character of the propaganda must vary accordingly. The cause for which we fought during the War was the noblest and highest that man could strive for. We were fighting for the freedom and independence of our country, for the security of our future welfare and the honour of the nation. Despite all views to the contrary, this honour does actually exist, or rather it will have to exist; for a nation without honour will sooner or later lose its freedom and independence. Written between the two wars, Hitler has substituted worship of Truth (Christ) with worship of his national sovereignty. His (very understandable, I might add) passion for his country has over-extended to manipulate others utilising the tools of the devil to achieve his goals. A slippery slope that only has one possible outcome of course. Now listen to how important this is to him – the avoidance of national slavery – something he had borne arms against personally just a few years before. It is that the vital questions involved in the struggle of a nation for its existence must not be subordinated to any æsthetic considerations. The yoke of slavery is and always will remain the most unpleasant experience that mankind can endure. [The Jews] are the modern inventors of this cultural perfume. Their very existence is an incarnate denial of the beauty of God’s image in His creation. Not written as an anti-semitic book as such, it is however very clear that the seeds of Jewish persecution were firmly rooted and ready to flourish in Hitler’s worldview. Propaganda is not easy to maintain. I chose to stop lying in my early 20’s. I’m sure many will expect that this was a highly religious matter, however it wasn’t. I just hated getting caught out and swore to myself that I wouldn’t do it again out of simple self-interest! I simply wasn’t smart enough to remember the lies I told, or to cover my tracks and worked out that it was a lot easier to shoot straight no matter what. I’ve been dealing with lots of dumb thieves in Samoa. Seven out of nine of our emplyees have either gone to jail or will do time. None of them could lie or conceal their skulduggery to save themselves – most a Weetbix short of a breakfast when push came to shove. But two of them were sneaky and skilled at deception. We got them in the end, but they were hard to entrap. Good deceit needs smarts. propaganda demands the most skilled brains that can be found. It’s interesting that I found Mein Kampf quite lucid, whereas some with agendas write it off as rambling nonsense. Rambling as from one who is not a professional author it may be, but nonsense, no. The man experienced life, thought about things, learned from them and garnered an opinion and then acted on the courage of his convictions. Those that call him an imbecile and only inspired to greatness by Satanic forces at times may too have an agenda. Hitler made some interesting observations about HOW propaganda should be used, also using a phrase that I use frequently in regards to embellishing the truth somewhat. The aim of propaganda is not to try to pass judgment on conflicting rights, giving each its due, but exclusively to emphasize the right which we are asserting. Propaganda must not investigate the truth objectively and, in so far as it is favourable to the other side, present it according to the theoretical rules of justice; yet it must present only that aspect of the truth which is favourable to its own side. I love that . . . “putting the facts in a light that favours ourselves” is the way I like to put it. I never knew that I was quoting Hitler almost verbatim! Propaganda must be limited to a few simple themes and these must be represented again and again. Here, as in innumerable other cases, perseverance is the first and most important condition of success. Only by following these general lines and sticking to them steadfastly, with uniform and concise emphasis, can final success be reached. Then one will be rewarded by the surprising and almost incredible results that such a persistent policy secures. Hitler’s propaganda machine was real. He knew how to use it to achieve his objectives. This we all know and can see. What is NOT widely known outside of conspiracy circles though is that his arch-enemy (the Jew) is also very real and also knows very well how to use it. We are all in the midst of this same war – a war of perceptions – fought in the marketplace of ideas. Much more to follow . . . but in the meantime, from where do YOU get your primary information? Are you sure that you too are not being manipulated like the people of Germany were, by the master of propaganda himself? Everywhere I look, I see people with agendas peddling their stories, TV, Radio, Newspapers, Politicians, Religious leaders, Environmental Groups, Secial interest and lobby groups . . . there is seemingly no end to it! I really wish there could be something that is a PROPAGANDA FREE ZONE. Then I turn that pages of the Good Book, and see the words of the other Master, the one that said, “I am the way, the truth and the life . . . ” and peace descends!